SB 151 (Jones) proposes a change in the make-up of Kentucky’s Public Service Commission by increasing the number of commissioners from three to seven and making them elected positions instead of appointed. This model has been used in 13 other states and brought instability in the utility markets by politicizing the process of reviewing rate cases brought before the commission. The measure passed the Senate last week and is being fast tracked in the House, receiving a hearing in the House Tourism and Labor Committee Thursday morning. The Kentucky Chamber of Commerce, along with the Greater Owensboro Chamber, Greater Louisville Inc., Commerce Lexington and the Northern Kentucky Chamber joined other business and environmental groups at a press conference to announce opposition to the bill on Wednesday. The Kentucky Chamber started running issue advertising on radio stations across the state Friday morning. To hear the Chamber’s ad click here. Electing PSC members will increase rates and bring instability and inconsistency in Kentucky’s energy market which will lead to a net job loss. Only 13 states currently elect PSC commissioners and ALL 13 have higher rates than Kentucky (see map below). 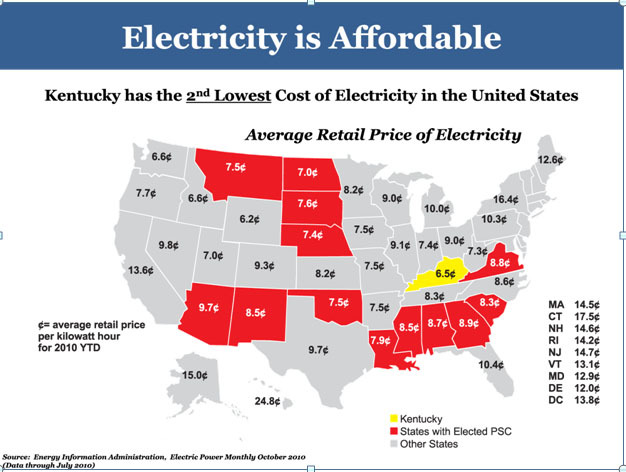 Kentucky currently has the second lowest cost in the nation for electricity in the United States at an average of 6.5 cents per/kilowatt hour (Energy Information Administration). Electing PSC members creates uncertainty that will be included in the borrowing costs of capital for utilities to build plants in Kentucky and comply with environmental mandates. Consumers will pay this cost in their higher bills. Each of the current three members are appointed by the Governor, confirmed by the Senate. The Kentucky Attorney General participates as the residential consumer’s advocate in utility rate cases to provide legal representation for consumers who pay utility bills. The current process is a quasi-judicial process and like court proceedings. It is designed to limit the political pressures from any one special interest group and keep the focus on fairness and low rates. SB 151 will only insert politics into the regulations of utility rates. New Congressional-sized races for the PSC would surely attract significant national special interest 527 campaign money. Outside interest groups, including anti-coal activists with the goal of influencing Kentucky’s current energy policy, will inject their views into Kentucky policy. Help us keep Kentucky’s utility rates among the lowest in the nation! The Chamber is asking members and non-members to call 1-800-372-7181 and leave a message for your representative, asking them to vote no to SB 151.